RingCentral is the top-rated platform for Voice Over IP (VoIP) telephony and unified communications. 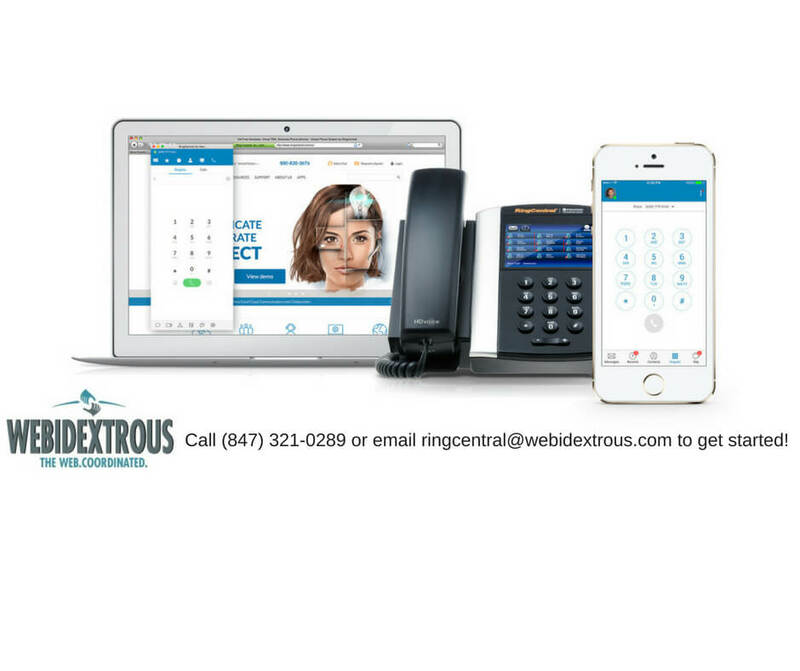 Webidextrous is a certified RingCentral partner. We make RingCentral Unified Communications even easier to install and use. We provide project scoping, estimation, and start-to-finish integration of your new RingCentral Unified Communications phone system. Give us a call or fill out the form on this page to get started. With RingCentral Audio Conferencing, you’ll never miss an important group call or meeting. Get a single, dedicated audio conferencing bridge dial-in phone number for easy universal access. Assign each user a unique host code and participants code that is exclusively theirs to use, ensuring that multiple users in the company can hold conference calls simultaneously and no one interferes with anyone else. Always be ready and available. There’s no need to make a call reservation or schedule a call—ideal for bringing people together for ad hoc discussions. The best thing about RingCentral Unified Communications is the astounding level of integration possibility it provides. Webidextrous can hook up your RingCentral implementation with Box, Desk, Dropbox, Google, Microsoft, Okta, Oracle, Salesforce, ServiceNow, Zoho, and Zendesk. Your sales and customer interaction will improve by leaps and bounds. As a RingCentral Partner, we can get your phone calls seamlessly integrated with Microsoft Outlook. You can now handle all your business communications without leaving Outlook. • Make and receive calls, listen to voicemails, and text directly from Outlook. • Merge contacts and call using click-to-dial calling. • View the entire call history in the Outlook browser. • Schedule audio and video conferences without leaving Outlook. • Intuitive layouts on both desktop and mobile interfaces. • Improved data loading delivers quicker reporting. • Expanded report filters now available. On Polycom phones, you can search and contact a colleague from any end point, including the RingCentral mobile app and RingCentral for Desktop. • Longer SMS message support: Character limit increased from 160 to 1000 characters. Send complete messages in one text message. • HD Voice: RingCentral mobile app is updated with OPUS Codec Support to provide better call clarity, particularly in limited bandwidth and network environments. • RingCentral for Desktop: With one-tap, send audio conference invites, utilize public and private locations to park calls, and resend and forward faxes. • RingCentral Android™ mobile app: Users automatically launch and start RingCentral Meetings with just a tap—no additional login required. New toll-free minutes bundles are available. You can now buy toll-free minutes to fit your requirements.